There is something truly impressive about Tokyo. While Hong Kong’s jungle of buildings built on rocky islands and peninsulas beside the water is more picturesque and vibrant, while Shanghai conveys the raw power of rapid high-rise development, and while Beijing manages to become more dusty and monumental the more it tries to modernise, Tokyo is amazing for being just what it is — an incredibly clean, orderly, and disciplined (although disorderly from a planning point of view) urban sprawl that literally stretches as far as the eye can see. These are a few shots of Tokyo taken from the Myogadani Atlas block of high-class high-rise apartments above Myōgadani subway station (茗荷谷駅), looking mainly to the west and south, that show the western Yamanote area and the suburbs beyond. They were taken on 5 September 2012. 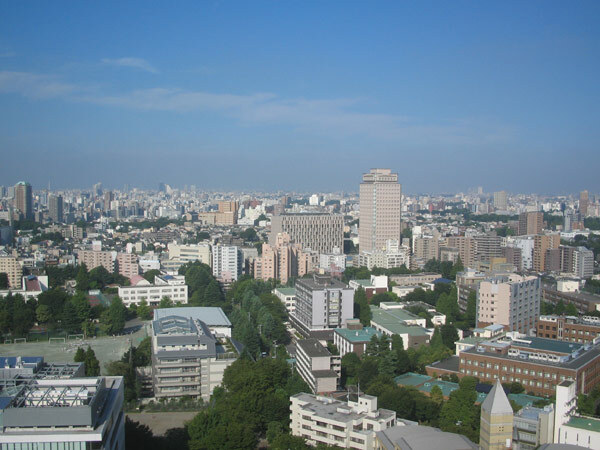 The first shot is a view looking west northwest towards Ikebukuro (池袋). Although the weather was fine and clear, there is a definite smog visible over the city. The wooded area slightly left of centre is Gokokuji (護国寺). The second shot is looking between Ikebukuro and Shinjuku — roughly west. Unfortunately I’m not familiar enough with modern-day Tokyo to be able to identify any landmarks in the distance. The charmingly-named Ochanomizu University (お茶の水女子大学), literally, ‘tea-water university’, can be seen in the right mid foreground. 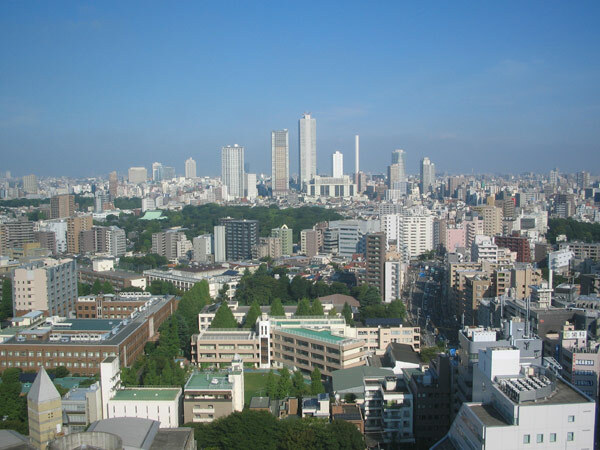 The third shot is a view roughly west southwest in the direction of Shinjuku (新宿) and its forest of high-rise buildings. The ‘sub city centre’ (副都心) certainly looks more impressive than it did when it first sprang up in the late 60s. 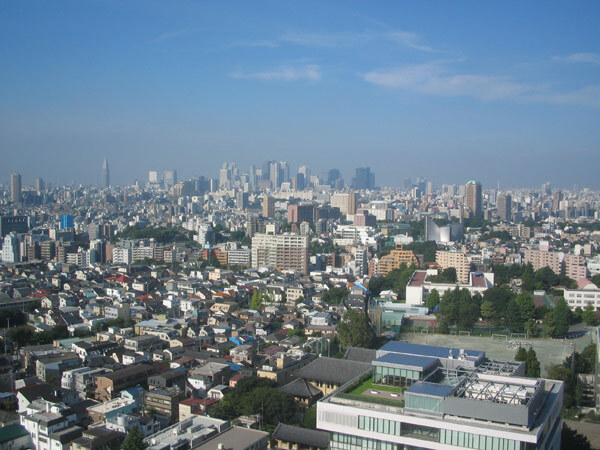 Several days later, the smog cleared enough to allow Mt Fuji (富士山) to be seen in the distance behind (and slightly to the right of) the Shinjuku area. While Tokyo is a huge city and its vibrancy can’t be captured in serene photos like these, the overall impression I gained from Tokyo, as compared with Beijing, was how clean, quiet and orderly the city is — almost like a large country town! By comparison, Beijing is dusty, untidy, and noisy. Neither the wide socialist-style boulevards and ring roads, nor the attempt to create a new ‘CBD‘ (北京商务中心区) in the east and ‘financial street‘ (北京金融街) in the west can hide or change the undisciplined, unkempt, north-Chinese feel of Beijing’s streets. While the reason may lie with their different stages of development (Tokyo drifting into quiet middle age, Beijing in a rush to develop before old age sets in), the two are truly quite different cities! Your last paragraph sums up perfectly the different of the two cities. Although it has been a long time since I last visited Beijing but not much has change in terms of ‘orderly’ and ‘cleanliness’ compare to Tokyo and Tokyoko.